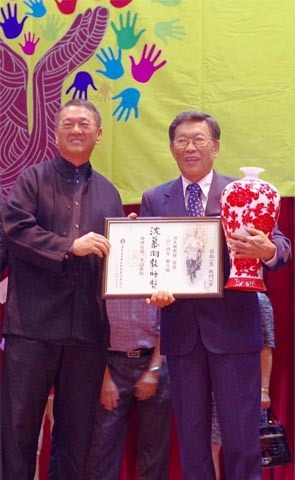 Prof Dr Ang Tian Se, the first Head of Chinese Studies Department in UTAR, received the Sim Mow Yu Teacher Award 2014 from Jiaozong (United Chinese School Teachers’ Association of Malaysia) in a ceremony held at New Era College on 5 October 2014. The Sim Mow Yu Teacher Award is one of Jiaozong’s key initiatives. The award is aptly named after the late Datuk Sim Mow Yu as recognition of his excellent efforts and indomitable spirit in upholding Chinese education as a lifelong career. The recipient of the Award epitomizes such noble objectives of being a role model teacher and an active contributor of education to the Chinese community. “I am honored and delighted to receive the award. Thanks to my parents, mentors and my wife who supported me,” said Prof Ang in the delivery of his speech at the ceremony. Prof Ang added that we should follow the late Datuk Sim’s footsteps to develop a brighter future via education for the community. Prof Ang has served in the education sector for more than 40 years. 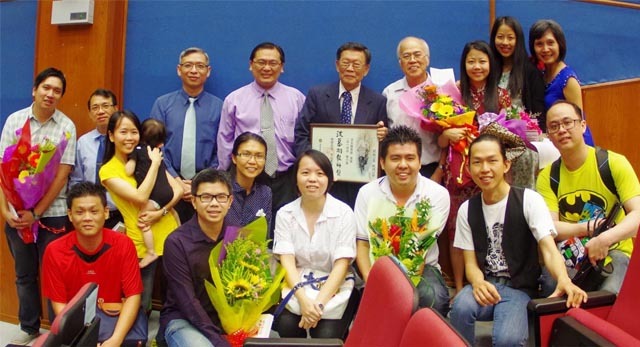 He helped to establish the UTAR Chinese Studies Department in 2002.